Most medical practices have a Facebook page, but are they making the most of it? Below we’ve listed three quick and easy ways to make your Facebook page more engaging and drive traffic back to your website. The best part? They’re integrated into Facebook and totally free to use! Make sure you’re taking advantage of the engagement and promotional tools Facebook has built right into your page. 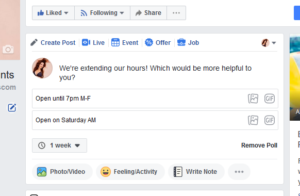 Facebook allows business pages to have a Call-to-Action button at the top of the page, making it extremely convenient for page visitors to contact you by email, phone or website, or to book a service, download an app, or more! To add a call-to-action button to your Page, you’ll need to be an admin, editor, moderator or advertiser. 1. Click + Add a Button below your Page’s cover photo. 2. Select a button from the dropdown menu and follow the on-screen instructions. 4. Hover over your button. 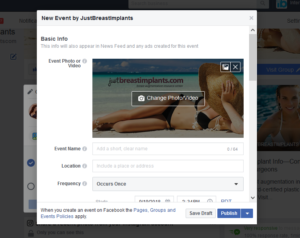 Posting a special offer or promoting an event your hosting can really increase engagement and interest from your Facebook audience. Creating an offer allows you to share discounts and deals. You can customize your deal in various ways, including whether people can redeem it online or in your office. 1. 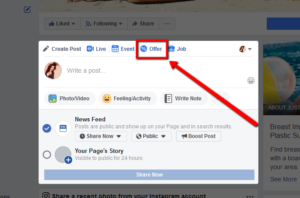 Click Create an offer in the Create Post box at the top of your Page’s timeline. 2. A new window will open that provides options to customize your offer. You can edit the expiration date for your offer if you’d like it to run longer or shorter than a week. 3. 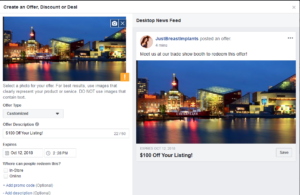 Add a photo and select whether people can use the offer Online or In-Store. You can also add a promo code or terms and conditions (optional). To add an event, simply click on “Event” rather than “Offer” in the Create Post box at the top of your timeline, then follow the similar steps in the new window. Once your event details are filled you, you are ready to publish. 1. Click See All at the top of your Page and then click Create a poll. 2. Enter the question you want to ask people. 3. In the boxes with Option 1 and Option 2, enter the options for your poll. 4. Click or to add a photo or GIF to your options. 5. Click 1 week to choose when you want your poll to end. Facebook is a powerful platform for any business, and medical practices are no exception. Don’t be afraid to dive in and start leveraging some of the tools Facebook has already provided! For more ways to improve your social media presence, contact us!